Today we’ll be explaining what this Volunteer Type widget is and what it means for the club. I’ve been wanting to offer this information for quite some time but never could find a big enough block of, well, time to figure it out. It appears to be easy at first glance but extracting the information from the database and presenting it visually and correctly took quite a bit of experimenting. Being rusty at web stuff didn’t help, either. Most obvious in terms of what it’s defining. However not all trail outings are classified as trail construction. If one of our group work days is mostly or completely just maintenance then the outing is classified as maintenance. Some groups of weekday builders also classify their hours as trail building if that is primarily what they’re performing - think of the weekday Rock Hollow mini-builds in the past. About 95% - Only our permitted solo builders which are very few and far between may miss posting their hours but every club group outing is tallied. It’s one of our most important metrics. Nearly all of hour self-reported hours come in the form of trail maintenance. From clearing limbs to deberming cupped out tread to honeysuckle and litter removal this is a catch all. However, as mentioned above, some of our trail builds - “workdays” in old parlance, are mainly trail maintenance outings. Many of our past Castlewood days have been about maintenance, for instance. 70-80% Many volunteers do report but many of our members also forget to report their hours. I can be one of them but when I remember I fill out the log even if it’s months later. Just back-date the day and remember to the best of your knowledge, however, try to be accurate in 15 minute increments of your time spent on the maintenance. This is a core term in the database that I’m not certain can be changed. Meeting to GORC could be accurately termed Monthly Social. Meetings with land managers usually fall under General Administration or Trail Design if we are getting trail approvals during a walkthrough. Each person present at a Monthly Social is accounted for and the social hours are cumulatively added together. Any time our volunteers or trail stewards are out in the woods connecting the dots to make a new trail their hours are tracked with this type. This includes looking at maps, walking in the woods to seek out points-of-interest, figuring out how to cross a drainage and keeping a trail fun and engaging for all designated users. Peer reviews and land manager walkthrough approvals are also tracked with this label. Determining reroutes are also part of the trail design umbrella. About 70%-80% - Because many of our trail stewards must self-report their hours we rely on them to sit down and input the data. I have slacked myself so I know this figure is underreported to an extent. What does this even mean? Cutting out deadfall that ends up on the ground across the trail. Due to nearly all of our trails being designated multi-use by land managers the club cuts out 95% of the trees that end up across the trail including deadfall that’s leaning or has created a hazardous condition. Some land managers don’t permit us to cut deadfall such as Lost Valley so our hours would be higher in that instance. There’s only a small handful of certified sawyers permitted to cut out deadfall on our public lands where it’s permitted so a lot of these hours can be attributed to 1-2 people. Our biggest Sawyer is Glenn who is an immense help. A swamper is the person that moves cut deadfall out of the way and assists the Sawyer as needed. It’s very important to have at least two people when cutting deadfall to remain safe and work together. Nearly 100% - Sawyering/Swamping is not using a folding saw to cut out small limbs or trees and we know who is cutting out the deadfall and they are reporting their hours. Many solo deadfall efforts of small limbs or trees cut out using a packsaw are probably underreported and would also fall under trail maintenance if people end up reporting their time. This is a catch-all term that literally encompasses anything else that keeps the club operating. So what things do keep the club running? And completely by VOLUNTEERS? Our primary board members who talk to land managers, answer emails (mostly), discusses projects, deals with insurance renewals, researches and presents proposals to municipalities, etc, etc, the list goes on. Our graphic designer who never reports her hours making changes to our print materials, designing new materials, formatting our building schedules, creating Terrain ads, designing cakes, making rad t-shirts and anything else that is graphic in nature. Our membership/web person who keeps the website updated, makes these widget things, posts to social media and keeps getting the word out on trail builds, sends out membership packets after making the membership packet. The person goes to the post office to mail them and writes lengthy pieces explaining who we are and what we do but mostly why we do it. Facebook, instagram, keeping things linked together and ensuring there’s continuity across platforms (the brand, the presentation) all takes thought and time and effort. He works closely with the graphic designer and they both work with everyone else to keep the club operating. Emails are round robin to our board members and past presidents for discussion, guidance and ultimately, descisions. And all these hours should be reported under the General Administration type. 25% at best. The hard-working volunteers keeping the club going are probably the worst offenders for tracking their own volunteer hours when it comes to paperwork or intangible efforts. I know of 10 people that barely report any hours and represent 75% of the administrative workload. I can’t even get by wife to report her hours. 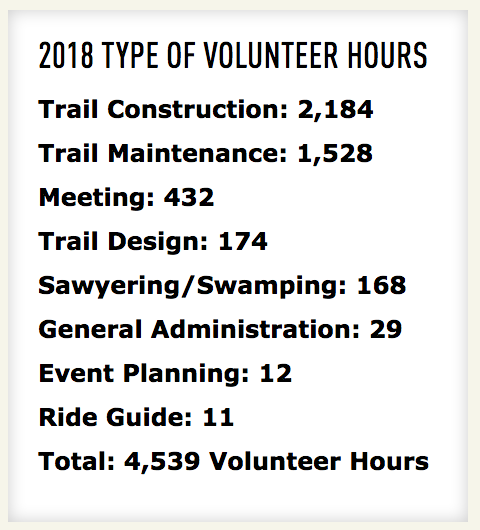 This is a metric we NEED to improve so that land managers and the public know what it takes to run a volunteer non-profit dedicated to natural surface trails. This type captures volunteer hours related to things like the Fat Tire Campfire, Mississippi Valley Expo, Life Outside, Take A Kid Mountain Biking Day and any other event we attend where we aren’t necessarily the hosts but are helping promote our club or are helping at the event in a volunteer capacity. Again this is a legacy term that might be better listed as Event Volunteer. I will look into this in the future but it might be a core term in the system. About 50% - Due to the hectic nature of events many times we forget to pass around a volunteer tracking sheet and also some events have shifts so one group doesn’t get the list or is accidentally left off. We need to be better about reporting our time at events. These hours are typically tracked by our hosts of the St. Charles Night Ride series but any other “guiding” should be captured in data. The leaders of the First Sunday ride should also track their hours and anyone else that represents GORC as a ride guide. Maybe 50% - Unknown at this time due to determining who should be reporting their hours as Ride Guides. This metric could be improved.